Another material that is a popular 2017 patio flooring is stone. Stone adds a natural and elegant look to any area and is especially great for traditional styled homes. There are a variety of different types, sizes, and colors of stone patio pavers to choose from, including flagstone, cobblestone, and travertine. Scroll through our stone patio pictures to see images of different designs, layouts, and material combinations that can be used. For those homeowners who prefer a natural look, consider using stones cut into rudimentary shapes to imitate the innate structure of the rocks. If instead you wish to establish a more organized look, choose stones that are cut into geometric shapes such as squares, rectangles, or circles. 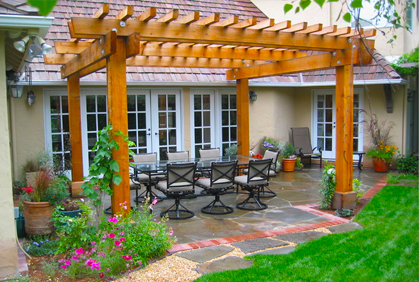 In addition to concrete, stone, and brick, wood can also be used to construct a patio. While wood is most commonly used for patio deck design plans, it is a great material for outdoor use on a patio as well. Wood is both durable and can withstand harsh weather conditions, with the adding bonus of blending in with the natural surroundings of your landscape. Wood patios look great in combination with plants, flowers or gardens. Our patio landscaping photos will provide you with images of the best designs with colorful flowers, beautiful vegetable gardens, or eye-catching bushes and trees to incorporate into your building plans. The most popular pictures of patios will provide you with wonderful ideas about the design of your outdoor area including the size, shape, and even materials to use. There are many different ways to design your exterior living space ranging from a simple concrete slab to elaborately arranged stone patio pavers. Our photos will help to make the process less intimidating and aid you in becoming a creative do it yourself designer. The first step in your building process should be to choose the right material for your home. Our simple patio ideas provide images of a variety of different decking materials including concrete, wood, brick, and stone. If you are looking for a way to provide a roof or some type of shade structure to your outdoor living area, consider installing a patio cover. 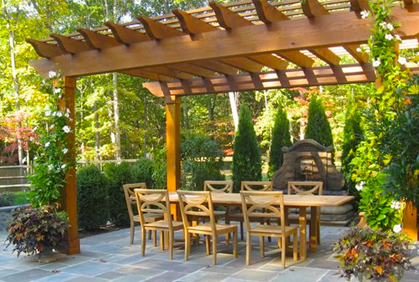 Covered patio designs show beautiful structures that block unwanted UV rays, protect from rain and other inclement weather, and add a wonderful, decorative touch to the area. Our gallery is filled with images of popular covered structures, including gazebos, arbors, best patio awnings, and lattice structures. Other common additions that will enhance the look and feel of your patio include purchasing patio furniture. Patio furniture is great for use in entertaining guests, enjoying a meal outside, or providing you with a place to sit while watching the children play. 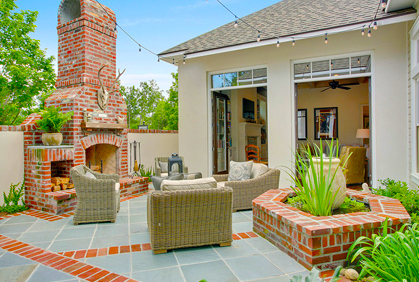 Other popular materials to use for your best patio flooring is brick. Like concrete, brick is a very durable and long lasting material that is naturally resistant to water and sun damage. Outdoor patio photos depict this material most often because brick is able to withstand inclement weather and adds a beautiful look to your home. Check out our brick patio pictures to see the top choices for incorporating this material into your outdoor home design. It is most often used in conjunction with brick homes of any color to maintain an elegant look. The only downside to using this material is the price. 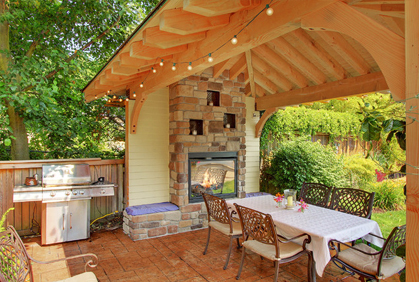 The cost to build a brick patio can be expensive, so make sure your budget can afford it. If you are looking to revamp your backyard to enhance your living space and create an area for your family and friends to gather and enjoy the outdoors, consider building a patio. 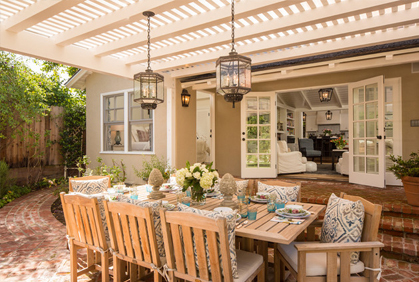 No home is complete without a beautiful outdoor living space for children to play on, entertaining guests, or just enjoying one another’s company in a relaxing outside environment. Designing outdoor patios for your home will not only increase its resale value, but also add to your family’s quality of life. Simple patio designs and photos show that there are countless options to choose from when it comes to building your outdoor space, and each design has its own advantages and disadvantages. Because you must factor in the location, size, and style of your home, it is important to select the best outdoor patio design based on your needs to ensure that your exterior living space is both functional and attractive.